That's one quick way to call upon a swankily dressed ghoul! But if summoning a mischievous poltergeist by saying his name three times in a row isn't your style, you can also dress your little one up in this creepy Deluxe Beetlejuice Costume, and you'll have your own little "ghost with the most" running around to terrorize everyone he meets! It's hard not to like the spooky bio-exorcist from Tim Burton's classic scary comedy movie Beetlejuice, even if he can get pretty scary whenever he starts working his magic. But while he might turn into a giant snake monster, or make the furniture spring to life and start chasing people around, Beetlejuice has a style all his own, which makes him so much fun to watch! 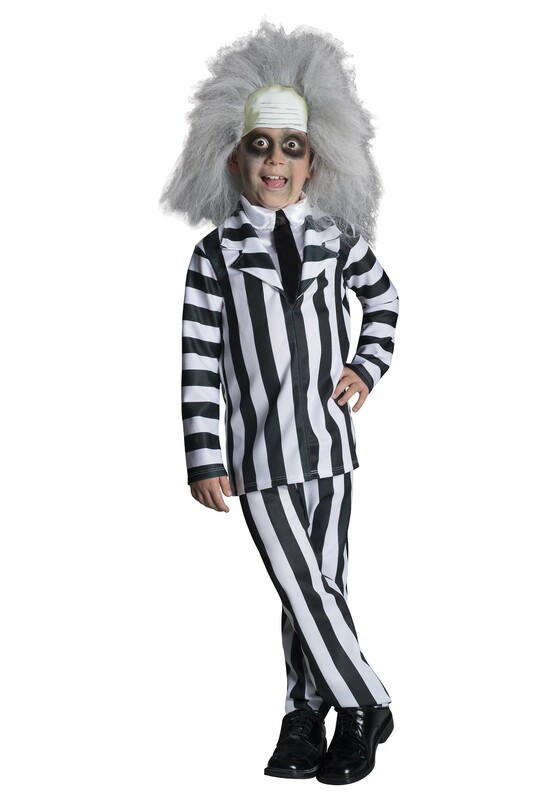 Your little one won't be summoning specters and supernatural forces whenever he's scaring up a good time in this costume, but we're positive he'll have some tricks up his striped sleeves that will frighten even the bravest of your friends and family members! Don't worry if scaring isn't his style, though, since he'll still look pretty cute in this striped suit and tie! This officially licensed costume is modeled after the character's outfit from the movie, so just add the matching wig and makeup kit to complete this ghoulish style. He'll look so much like Beetlejuice, he might even start showing up out of nowhere whenever you say his name three times!